Mutual Grooming in Horses - You Scratch My Back, I'll Scratch Yours! 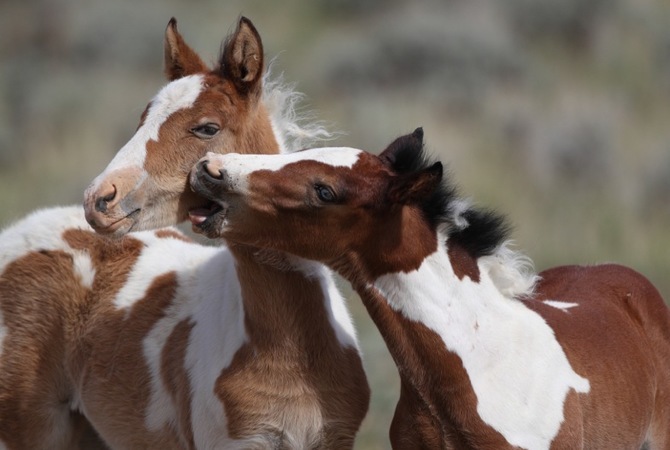 Pinto foals engaging in mutual grooming and horseplay. According to a Horse Behavior and Welfare Course, presented by My Horse University based at Michigan State University, care-giving behavior also known as epimeletic behavior which includes self and mutual grooming is one of eleven important horse behaviors related to relationships within a herd. Mutual grooming behaviors are an important activity because they helps create social bonds. According to recent studies, "feel good" hormones are increased in horses that undergo mutual grooming sessions, and horses also have preferred grooming partners. According to Stacy Westfall, noted horse trainer, horses often start by scratching each others withers but will move up and down each others body, not only rubbing with their strong upper lip but also using their teeth to both scratch and to gently nip. Many horses seem to both agree on the amount of pressure, while others will increase the pressure and nipping until offending the other horse who generally leaves. Most horses involved in mutual grooming are close companions during turn out and other times that they are together and seem to have a mutual agreement: You scratch my back and I'll scratch yours! As pointed out by Karen L. Overall, MA, VMD, a horse behaviorist who contributes to Merck's Manual, mares have preferred associates, are preferentially groomed, and will groom certain individuals. Mares spend more time in mutual grooming than stallions, and fillies spend more time in mutual grooming than colts. 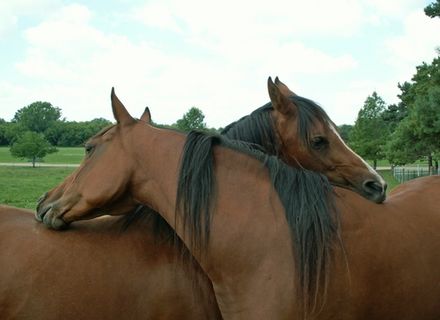 Filly games often focus on mutual grooming. Fillies will groom both colts and fillies while colts tend to groom only fillies, which has been interpreted as practice for later courtship behavior. Among adults, the grooming partner is usually the preferred associate and close in social rank. When stallions engage in mutual grooming it is usually with a mare and is considered mostly as a form of courtship. In this case the grooming is not reciprocated by the mare so it isn't truly mutual grooming. Horses often begin a mutual grooming session by scratching each others withers but then move up and down each others body using their teeth to scratch and gently nip their grooming partner. Occasionally unidirectional grooming is observed in younger horses. Mutual grooming is most common in the spring when the winter coat is being shed. The seasonal pattern indicates that the horses are reacting to the discomfort of a thick coat in warm weather or to changes in day length. In general, horses that engage in mutual grooming behaviors get along well with each other. They socialize with most members of the herd, but they tend to seek each other out when back scratching is in order. In a sense, they get a feeling of belonging in their own mini-herd. Although researchers have not been able to identify a facial gesture by a horse that signals an invitation to groom, nor has any signal that causes the horse to change sides so that a horse that was grooming the right side of his partner now grooms the left, horses seem to know just what to do. Another form of what may be regarded as mutual grooming is seen when it comes to tail swishing to keep flies and insects off other horses. Again, the horses stand in reverse parallel positions and swish flies from one another's face and forequarters. Also, mares often engage in the use tail swishing to keep flies off their foals faces and bodies. Mutually groom a human? What then? When humans groom a horse, some horses take it as an invitation to initiate a mutual grooming session and begin nibbling at the person doing the grooming. Horse behaviorists recommend that ideally, if the horse has the urge to respond, rather than punishing the behavior, an alternative may be offered such as a piece of coconut matting placed at the right height for the horse to "groom." No mutual back scratching going on here! Don't want your horse grooming you? Tying or having someone hold the horse while grooming will prevent the horse from attempting to treat you like a pasture mate. "Often when a young horse is being groomed by a human the horse will also turn and try to groom the human back. I have seen some people who allow this, some who hold out their hand for the horse to scratch and others who teach the horse to enjoy the grooming without returning the favor to the human." "So sometimes while a human is grooming her horse, especially if the human is using a curry comb or scratching with her fingers, her horse will turn around and try to groom her back. I don't allow my horses to groom me - I'm not a horse and don't want to be treated like a horse. Once you allow your horse to treat you like a horse, you open yourself to being on the receiving end of dominance behaviors like biting and kicking as well as comfort behaviors like grooming." "I keep my horses tied when they're being groomed, and if one does reach around to groom me, I gently push their head away from me. I don't hit them, slap them, or make a big deal of it. I either use my open hand on their cheek to push their head away, or I tug on their halter or lead rope to push their head away. After a few times, most horses understand that you don't want to be groomed and they leave you alone." Most horses truly enjoy the scratching and grooming by trainers, riders, and owners. Grooming your horse is a great way to help him relax with you, trust you and bond with you. So enjoy your grooming time - without being mutually groomed!